Raymond Tabugon and Lolito Sonsona of the Philippines will face the Moloney Brothers on August 19, 2017 in Australia. The Filipno Raympnd Tabugon 20W(10KO)-7L-1D will face the undefeated Andrew Moloney 13W(8KO) for the WBA Oceania super flyweight title. Tabugon who had fought the best in the division will try to stop the Australian prospect. Tabugon loses to the notable figthers including Juan Francisco Estrada, Makazole Tete, Juan Hernandez Navarrete, Luis Nery and more. Meanwhile, Lolito Sonsona of General Santos City, Cotabato del Sur, Philippines will face the current WBA Oceania super bantamweight champion Jason Moloney. Sonsona will fight outside the Philippines for the first time. He had some success in the Philippines and now trying to move up and beat highly rated boxers. Sonsona with a record of 21W(9KO)-1L-4D is coming off a unanimous decision win over Renren Tesorio. 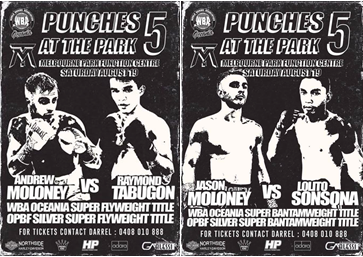 On the otherhand, Jason Moloney is a hardhitting boxer with a record of 13 wins with 11 of those are coming by way of KO. Jason Moloney currently ranked no. 41 in the world and defeated many Filipino boxers including Alvin Bais, Markquil Salvana, Jeffrey Francisco, Gerpaul Valero, and Marco Demecillo. Event will be held at Function Centre, Melbourne Park, Victoria, Australia.